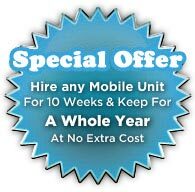 The Mobile Air Conditioners we have for hire have the latest technological advances in portable air conditioning. Our systems range from 8000 btus upwards in either cooling only or cooling and heating mode. Our AC hire systems also run more efficiently due to them re-using the water to aid in its cooling, resulting in less power consumption and is therefore better for the environment. Portable/mobile air conditioning units provide a cooling solution for almost any setting and situation. Spilt into 3 sections; Monobloc, Split and Industrial. Monobloc units are ideal for applications such as domestic and light commercial; they provide the ideal solution for those who need quick cooling solutions, with the convenience to easily relocate to your desired location when required. Portable/mobile air conditioning units provide a cooling solution for almost any setting and situation. Spilt into 3 sections; Monobloc, Split and Industrial. Our portable split air units have an evaporator unit and separate condenser unit. The unit is placed in an area that is in need of cooling, the condenser is then placed outside connected to the main unit via a refrigerant pipe through a door or window to release the warm air. These units are powered through a standard 13 amp power supply. These units are ideal for a range of applications, such as commercial offices, workplaces and classrooms. Spot coolers provide effective streams of cool air precisely to the area needed and because they cool specific applications often within a much larger area such as, industrial, warehousing / storage areas and in sectors such as food processing, printing and plastic moulding, as well as IT suites and TV and Film productions; where it is as important to keep the equipment cool and efficient as the people operating it, they are a very cost efficient cooling solution. Industrial units are infinitely more powerful than standard/monoblock units and are designed for use in server and computer rooms, large workshops, warehouses, TV & Film productions, as well as most large areas. As well as hire we also sell this equipment. Take a look at our portable air conditioning page for more information. If you are looking for refrigeration products such as cold rooms then you can visit our refrigeration site.